We are very happy to announce that Alan Schoenberger performed his renowned theatrical production Schoenberger Skis the Stage during the Salt Lake City 2002 Winter Olympic Games in Park City, Utah. Schoenberger is the world champion skier, dancer and theatrical clown who, in 1985, brought down the house by skiing the stage at the Bardavon 1869 Opera House in Poughkeepsie, New York. His show went on to tour nationally which included a rare live performance with the Rochester Philharmonic Orchestra at the Eastman Theater. In 1994, he performed on skis as the master of ceremonies at the opening of the World Cup in Vail, Colorado, and in 1996 Schoenberger performed at the grand opening ceremonies of the Vern Riff Center for the Arts in Portsmouth, Ohio. Schoenberger Skis the Stage, is a bizarre anomaly of a theater that happens to be entertaining, artistic, and completely delightful". Schoenberger has spent more than two decades cultivating a stage career that blends the magic and beauty of skiing with circus theatre and dance, all performed live on stage, on skis-- without a single flake of snow. Schoenberger's theatrical skiing antics are not new to ski resorts. In the early years of freestyle skiing he competed with one of his zany tragi-comic characters during an international freestyle shoot-out at Stowe, Vermont, which he won. That event ultimately led Schoenberger to win first or second in most all ballet contests, and win the coveted World Freestyle Trophy in Ballet Skiing, which was featured on ABC Wide World of Sports. On October 23, 2001, Schoenberger was honored in Utah with the Pioneer of Freestyle Skiing award as a key individual who played a major role in shaping the regions ski history. 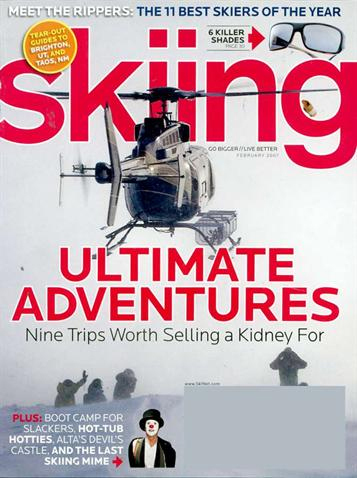 On February, 2007, Skiing Magazine featured Schoenberger in a four page article. Alan Schoenberger, a world champion skier, dancer and performance artist steeped in the traditions of the European character-clown, has spent over two decades cultivating a stage career that blends art and skiing. His extensive and varied performances have toured thirty-two states and four foreign countries. Born in Denver, Colorado, he spent his early years in Colorado, New York and Vermont. At the age of five he learned to ski under the expert tutelage of his athletic father and quickly absorbed his enthusiasm for skiing. Exploring painting, sculpture and photography in high school, Schoenbergers appetite for art grew as it did for skiing. Along with an excellent curriculum in fine art photography at Utah State University, he began experimenting with choreographed imagery in cinematography. This led in turn to dance classes for deeper understanding of the performing arts. Schoenberger's spare time, however, continued to be dominated by skiing. Under the wing of his ski coach, Bob Parker, developed his own unique and highly stylized ski technique. He won the Utah State University Ski Meister Cup, certified as a ski instructor and taught skiing full time for Junior Bounous at Snowbird, Utah. For Schoenberger, skiing ultimately evolved into an art form. The lyrical imagery of dance-like movements within the vast mountain landscape he revered became the dominant subject of his film work. At the same time he explored a new possibility -- and taught himself to dance on skis. There followed intense studies in theatre and dance in New York, mime and clown with Moni Yakim and Richard Morse; and many dance techniques, most particularly Merce Cunningham. He continued to winter in the mountains of Utah where his perceptions of blending live theater, dance, and clown on skis began to unfold. With encouragement from J. Milton Beens, and Chris Ryman, his performance work on skis emerged earning him an invitation to perform his work on snow at the Intermountain Ski Instructors of America (ISIA) annual clinic at Alta, Utah. There, Alf Engen and Max Lundberg invited Schoenberger to join the Alta Ski School and refine his movement work on skis. While at Alta, there began an intense focus on ballet skiing, and under the watchful eyes of Alf and Max, his art form on skis blossomed. Schoenberger continued to study theatre and dance in New York during the summer and fall months. Eventually, Schoenberger composed an alpine theatrical ski piece for the snow. His stage would be a ski slope at an international freestyle ballet skiing contest in Stowe, Vermont, where he offered his post-modern dance and clown performance on skis -- and won the contest. ABC's Wide World of Sports featured his novel performance, launching a new and eccentric career fusing the worlds of performance art and the sport of skiing. At the end of that season, Schoenberger was invited to Cervenia, Italy to compete for the combined world title in freestyle skiing (moguls, aerials, and ballet) which he won second place. In the two years to follow, Schoenberger primarily focused on ballet skiing, and after placing first or second in most all ballet skiing events throughout Europe, Canada, and the U.S., he won the coveted World Trophy in Ballet Skiing. He was continually featured in books, magazines and on television and film. The need to bring his work into a more formal theatrical environment ultimately prevailed and Schoenberger left freestyle skiing to create his snowless touring stage production Alan Schönberger Ski Bum in Piano Roll. He set out to ski the great stages in theatres across the country on the music roll of his larger-than-life player piano that he and his father designed and built. His extensive and varied performances have toured 36 states and four foreign countries including a live performance with the Rochester Philharmonic Orchestra and a PBS feature. In 1992, Alan Schoenberger co-founded the Turning Point Ski Foundation with his long time friend, freestyle champion and two term elite PSIA Demonstration Team member Ellen Post Foster. The Turning Point Ski Foundation is a 501(c)(3) non-profit organization and he toured his theatrical production to benefit youth ski teams. The Turning Point Ski Foundation has published five ski education books and one video, including the award-winning book Skiing and the Art of Carving. Alan Schoenberger returned to the snow in 1994 when he was asked to choreograph and perform on skis as the master of ceremonies, opening the World Cup in Vail, Colorado. In 1996, along with the Juilliard String Quartet, Schoenberger was invited to perform at the grand opening ceremonies of the Vern Riffe Center for the Arts in Portsmouth, Ohio. On October 23, 2001, Schoenberger was honored with the Pioneer of Freestyle Skiing award from the University of Utah Ski Archives as a key individual who played a major role in shaping this regions ski history. 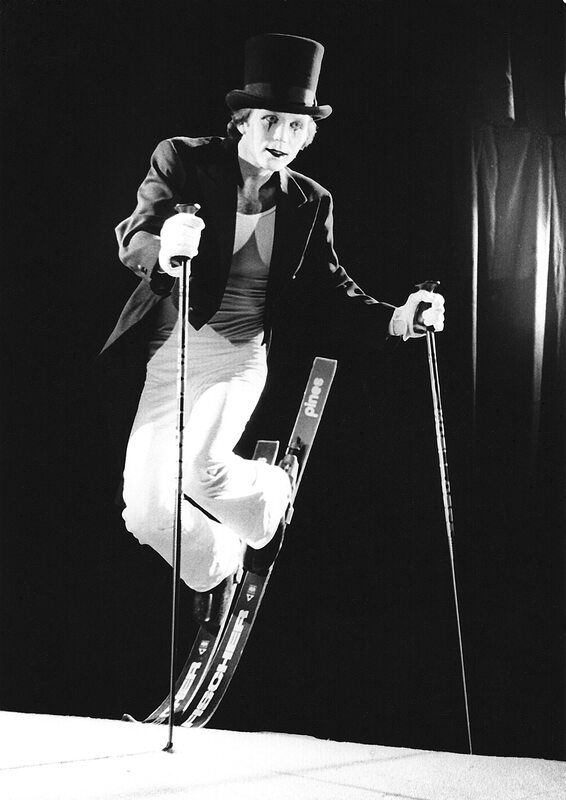 Schoenberger was invited to perform at the 2002 winter Olympics, where he performed Schönberger Skis the Stage, an eclectic mix of various theatrical ski pieces created during his diverse career as a performance artist on skis. He and his wife Debra share their time between their home and the ski studio in Park City, Utah, and his home and rehearsal studio on an island in Lake Champlain, Vermont. "Schoenberger Skis the Stage," is a bizarre anomaly of a theater that happens to be entertaining, artistic, and completely delightful. The one-man show stars Alan Schoenberger, a world champion freestyle skier who is a gifted performance artist. Talents for mime, clowning, magic, juggling, dance and skiing are combined into an impressive new art form. Words are not missed in this unspoken performance. Technical wizardry and stagecraft are potent ingredients in the show's success. Schoenberger's stage-skiing is done on an ingenious contraption rather like a huge treadmill tilted to a ski-able angle. This machine is flawlessly coordinated with excellent lighting and sound design to magnify Schoenberger's fine comic timing and lyrical sense of theatricality. In the persona of a baggy-pants clown called Tooloose Scattergood, Schoenberger takes the audience along as he experiments with learning to ski. An underlying message about persistence makes this a great experience for kids, and Schoenberger is adept at stepping through the fourth wall to interact wordlessly with young people in the audience. It is the black-diamond level of professionalism in all elements of the show that makes it satisfying for adults, who filled the majority of the seats at Friday's performance. The crowd repeatedly squealed with laughter at Scattergood's awkward antics in the early going, then whooped it up in the adrenaline rush that accompanied his transformation into a hot-dogging, mogul-shredding ski-maniac imbued with the grace of a ballet dancer. There is more than a little vaudeville to be witnessed along Scattergood's way to ski nirvana. Schoenberger is a clown of high skill and good judgment who sprinkles the evening with balancing and juggling acts, magic tricks and sight-gags like a three-legged skier. Combining well-produced, well-acted live theater with the transcendent joy of the ski experience is a pure stroke of originality, and it works. "Schoenberger Skis the Stage" ought to be the perfect show for Olympic visitors. Some things in life are impossible. Like attempting to describe Alan Schönberger's "Ski Bum; Piano Roll" performance in 20 words or less. Incredible. Hilarious. Mesmerizing. Impish. Ethereal. Stunning. Zany. Beautiful. Adventurous. Different. Goofy. Athletic. Graceful. Imaginative. Comedic. Creative. Loony. Wholesome. Delightful. Unbelievable. Gee, could I squeeze in "genius," too...and "magical"? This guy is not merely a clown. He's a clown who skis like a champion (with earned-in-Utah awards to prove it). He can even play the kazoo and ride a unicycle...at the same time. Clown, I've learned, is a lot like burlesque. Every little movement really does have a meaning all its own. All those pratfalls and silly sight gags are cleverly designed to make the audience believe the performer is uncoordinated. Like Schönberger's playful little grin, just when you're worried that he injured himself taking a spill. Or when he's slip-sliding his way through a routine, then inserts some sensational indoor "hot-dog" skiing, or displays his lithe and agile expertise at ballet-on-skis. When he comes schussing down his specially built indoor ski run on not one, not two, but three skis, you have this irresistible urge to fire off a fax to the "How Did They Do That?" television series. The centerpiece of the production is what Schönberger calls an "incline plane slip stage." What this is, basically, is a portable, indoor ski hill. The mountain's angle and speed are instantly changeable so that he can be skiing on a "bunny hill" one moment, then be on the verge of cardiac arrest because of its treacherously steep incline the next. At the base of this mountain is a 22-foot piano keyboard. Most of Schönberger's routines are accompanied by jaunty Scott Joplin tunes, and the keys on this larger-than-life piano move to the music. There are hundreds of comedians out there who want you to think their acts are "one of a kind." Alan Schönberger's truly is. And while this looks like a one-man show, it definitely is not. At the end of the performance, Schönberger brings his backstage crew to the front of the stage where the three of them share the well-deserved applause. If this show has one drawback, it's the unfortunately short three-night run (which - as you are reading this - is one down, two to go). There's not nearly enough time for word-of-mouth to spread. Sensitivity rating: No complaints about profanity with this show. Schönberger is speechless. And it's also squeaky clean. Bring the kids. They'll love it. In a display of skill and prowess, Alan Schönberger, dancer, skier, performer-extraordinaire serves up an evening of grace and elegance that never loses its feel for a well-placed rubber chicken. The Ski Bum, playing at Crested Butte's Center for the Arts Friday and Saturday nights, brings the audience into a delightfully twisted world of a giant piano turned ski slope. The little tramp should meet the ski bum. A World Cup champion freestyle skier, Schönberger had his insane inspiration while sitting in an Aspen bar watching a player piano. The scrolling, perforated sheet music, perched above the phantom keys, caught his eye. "I just imagined what it would be like to ski on that surface," he said. Six years and $200,000 later, Schönberger had a carpet covered treadmill, spinning up to 35 miles-an-hour above enormous piano keys plinking out Scott Joplin tunes, upon which to display the whirling beauty that made him a champion. Schönberger touched a cord with his audience early Thursday night as an awkward red-nosed neophyte. He reflected the crowd's own follies as he struggled to gather an unruly tangle of skis and poles or strained to rise from a nasty spill. He seized the opportunity to unleash the joy of those moments when you hope nobody is watching, but can't help laughing at yourself. His character quickly got the hang of the strange sport, delighting in each small triumph, and was soon in world class form. Schönberger calls his one man show a compilation of the clown arts, but the nearly packed house knew he was just clowning around. In a show that raised more than $5,000 for the Crested Butte Physically Challenged Ski Program, Schönberger tempered his athleticism with juggling acts and slight-of-hand, never slick but always silly. Schönberger said he wants to keep the audience on its toes, regaling them with one unpredictable stunt after another. He went to great lengths to extract a giggle, setting up intricate scenes for one, eye-popping laugh, which he punctuated with a slightly devilish, gape-mouthed grin. 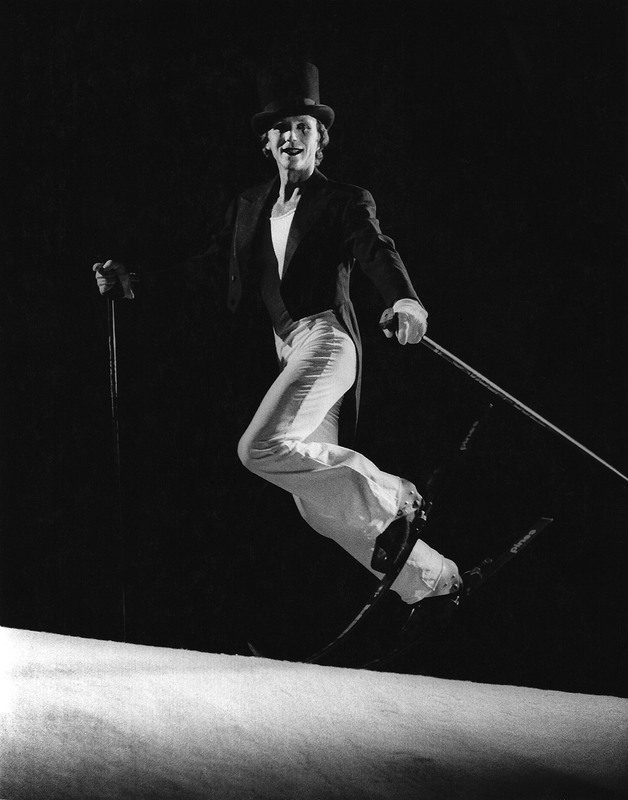 In a display of creativity that had the audience enraptured, Schönberger explored every comedic possibility of the stage, launching marshmallows into the crowd with his ski binding, sending a dummy crashing headlong down extreme terrain of the adjustable slope and dancing to The Doors tune "Strange Days" in a scene that can only be described as strange. Amidst the gags, pratfalls and a kick-started, kazoo-powered unicycle, Schönberger pulls a message out of his hat. The challenge of the hill is about reaching the top, Schönberger said, "Go for it, no matter what it is. Don't sit in front of your television all your life." A testimony to his art and his message, in one scene Schönberger spun from side to side of the scrolling stage, with the grace and control of an accomplished dancer. 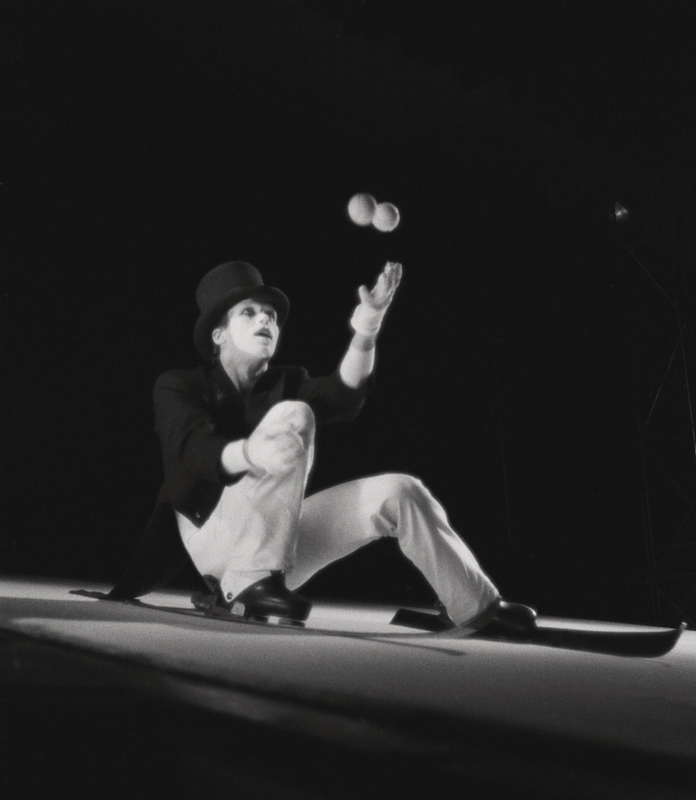 After showcasing movement that was often better felt than seen, he slid to a stop at the bottom of the slope and bowed deeply, sweeping his top hat low to the ground and slightly brushing a well placed rubber chicken. "Chaplinesque ski-clad Schönberger entertains hugely..."
"...wonderful performance art with a twist of aerobic alpine madness." "Schönberger stumbled on to the stage and into the crowd's heart, creating his bittersweet commentaries on life. It is an elegant display... a marvel in stage, lighting and movement." "...a lone comet blazing across the night sky of the imagination." "A performance by the Vermont native is like a visit to an intimate one-ring European circus." "Incredible. Hilarious. Mesmerizing. Impish. Ethereal. Stunning. Zany. Beautiful. Adventurous. Different. Goofy. Athletic. Graceful. Imaginative. Comedic. Creative. Loony. Wholesome. Delightful. Unbelievable. Gee, could I squeeze in 'genius,' too...and 'magical'?" "Clown artists, jugglers, and dancers are seldom found in the same arena as world champion skiers. Once in a while, chance may have them in the same room. Rarely will they be found in the same body and soul." "Schönberger's performance is truly remarkable and breathtakingly beautiful. His work enters that sacred realm of theatrical magic." "Alan Schönberger has brought fun, whimsy and slapstick from the mountain to the stage...a lyrical piece of theatrical magic." 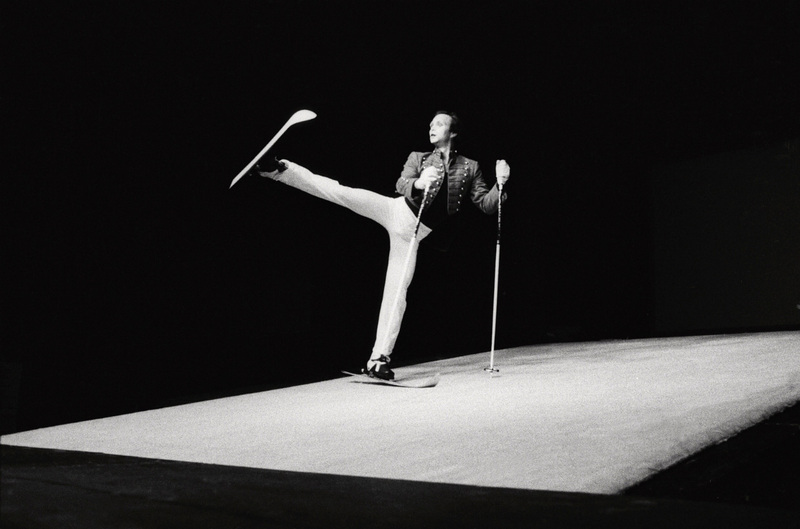 "When Schönberger wasn't captivating the audience with the strength and beauty of his dance and skiing, he was making them laugh with his off-the-wall antics. He had an audience of all ages in the palm of his hand." "It was indeed wonderful theater; funny, touching, and beautiful to watch....an amazing work."